‘In these dreadful times in which so much hate has been spread among different nations, the women have to show that we at least retain our solidarity and that we are able to maintain mutual friendship’. The following month, Chrystal Macmillan wrote to all 26 suffrage societies in the Alliance urging them to agree to meet in Holland to ‘discuss the principles on which peace should be made and, if so, to act internationally’. a conference could be summoned by individual women. Each national suffrage committee discussed and voted on whether to hold the international meeting in Holland. The UK committee of the National Union of Women’s Suffrage Societies (NUWSS), meeting in London, voted that an international women’s business congress should be organized by IWSA in 1915. This resolution was carried with only two members opposed. One of those who opposed was the President, Millicent Fawcett on the grounds that women are ‘as subject as men to national prepossessions and susceptibilities…..we should then run the risk of the scandal of a PEACE conference disturbed and perhaps broken by violent quarrels.’ [Wiltsher 1985] But she was probably influenced by a letter from Lord Robert Cecil in when he threatened to withdraw his support for the suffrage campaign if the women continued to talk about peace. In practice, Mrs Fawcett’s view reflected the view of many suffragists: by March 1915, the IWSA committee had voted by 11 to 6 that the IWSA would not call the conference. In the meantime those women who wanted a meeting were using Chrystal’s third suggestion – to call a meeting of individual women. In February 1915 Dr Aletta Jacobs called a preliminary meeting at The Hague. Women from Belgium, Britain, Germany and Holland sat down to plan. The British women who attended were Miss Chrystal Macmillan, Miss T W Wilson, Miss K D Courtney, Miss C Marshall and Miss E M Leaf. The British women came back from Holland full of enthusiasm. 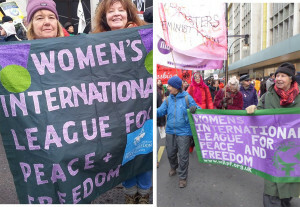 ‘Hundreds of women in Great Britain were convinced that their work lay not only in the relief of physical distress and suffering, but that upon them, as women and non-combatants, fell especially the duty of preparing the way for better understanding and lasting peace between the nations.’ ( Toward Permanent Peace 1915 p6). Miss Chrystal Macmillan returned to Holland at the beginning of April to assist the Dutch committee in making arrangements for the Congress. During the Congress, she acted as Chair of the Resolutions Committee at the Congress and was elected secretary of the new organisation International Committee of Women for Permanent Peace. She was one of five delegates elected to visit the Heads of State in Europe and America to urge the political leaders to consider mediation to end the war. She compiled and edited the Report of the Congress 1915. Kathleen Courtney was one of the NUWSS executive committee who resigned when Millicent Fawcett ruled that NUWSS would not send delegates to the International Women’s Peace Congress at the Hague in April 1915. She was one of the British women who met with the Dutch women in February 1915 to plan for the Congress and travelled to The Hague early in April to work with the Dutch committee on the organisation for the Congress. The new organisation formed at the Congress was the International Committee of Women for Permanent Peace; Kathleen Courtney was elected chairman of the British section which was called the Women’s International League. [In 1916 Kathleen Courtney also went to Salonika and Baxtia to carry out work with the Serbian Relief Fund for which she was later decorated by the Serbian government. After the war, Courtney helped her friend, Dr Hilda Clark, at the Friends’ Relief Mission in Vienna, and also travelled to the Balkans and Poland. In 1920s she became the president of the British Section of the Women’s International League for Peace & Freedom, and organiser of the Women’s Pilgrimage for Peace of 1926. Courtney was also active in the international effort that culminated in the presentation of a petition signed by several millions to the Disarmament Conference of 1932.